When it comes to bet sizing, sometimes less is more, as @HisandHersPoker show in a new hand analysis. 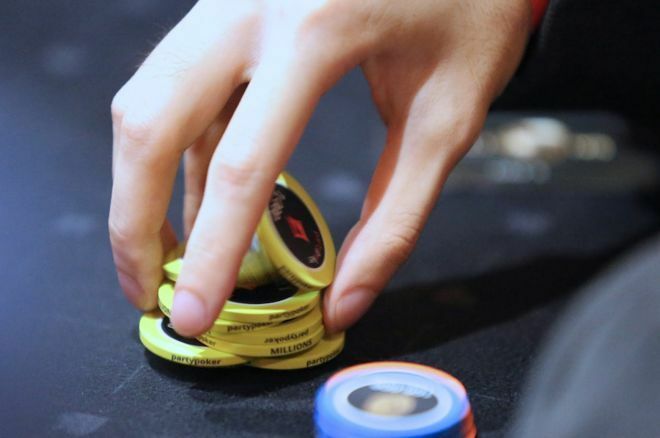 Hand analysis: Making small adjustments when sizing your postflop bets can produce big rewards. Greetings, Poker Friends! This week we are going to examine a hand in which Tracey feels she could have made a few small adjustments to her bet sizing. Read on and see if you agree. Hero (Tracey) is at a $2/$5 table at the Borgata in the early morning on Saturday. The primary Villain for this hand is a recreational player in his early 40s. He has been at the table for less than a half-hour, but he already seems to be on tilt. He got into an argument with another player over whose name was called first for the last open seat. He seems to be steaming over this issue and looking to gamble. The remainder of the table is mostly populated by loose-passive recreational players. It folds to the Villain who is in the cutoff seat and he limps for $5, as does the player on the button. The small blind also calls. Hero is in the big blind with and raises to $35. The Villain calls and the other two players fold. AKo is an excellent hand, but it is also one that does not want to play out of position in an extremely multi-way pot. In live games like this one, we usually advocate a preflop opening size of four big blinds, plus one extra big blind for each limper, plus one extra for being out of position. Here, that would be a total of eight big blinds, or $40. Upon review, a sizing of $45 or even $50 might have been better in this particular spot. We should always be willing to deviate a bit from our "normal" play to accomplish specific goals when warranted. Here, that goal is getting heads-up with the tilted Villain. Luckily, that is exactly what happened. However, we need to realize that this was an unexpected outcome. We should expect that a small sizing of $35 would get all of the limpers to call most of the time. A sizing of $45-$50 would have been better. We go heads-up to the flop with $80 in the pot. The flop is . Hero bets $40. Villain calls. Ace-king is a somewhat special hand that warrants some extra attention when it comes to continuation betting. The danger is to "autopilot" and treat it like any other unpaired hand when you don't flop an ace or king. However, AK is special in that it beats all other unpaired hands. On a board with only one Broadway card, Villain's limp-calling range now looks like this: a tiny number of sets, some pairs of queens, some low pocket pairs, and a whole heck of a lot of unpaired air. In other words, ace-king is still ahead of Villain's overall range. How do we want to proceed? If it helps, think of what you would do here with or . For all practical purposes, these small pairs are nearly the same holding as versus Villain's range. With all of these holdings, you should put out a small bet of around $30. This is a somewhat exploitative bet sizing, but exploitative is the name of the game against a tilted recreational player. Betting $30 here is a multi-purpose bet which benefits from the small sizing regardless of Villain's holding. First, if Villain has two unpaired cards, betting $30 is all you need to properly gain protection and deny Villain's equity. Anything larger is superfluous. Second, if Villain has a small pocket pair like or , you may well be able to get a fold from these hands which are currently beating your ace-king. This will only work if Villain is thinking, "no set, no bet." Also, if that's his mindset, you can probably get him off his small pair with the small bet of $30. In other words, betting $40 doesn't generate an additional $10 worth of fold equity and is, therefore, not worth the extra investment. Finally, for the times when Villain has a set or a queen, he's obviously never folding. Thus it benefits you to bet as small as possible to minimize your loss when Villain hit the flop. In summary, your thin showdown value holdings like AK benefit from a smaller bet sizing versus Villain's overall range. $40 was a touch too large here. With $160 in the pot, the turn brings the for a turn board of . Hero bets $85. Villain calls. The on the turn is a major scare card, one that also happens to give us top pair. A good rule of thumb to remember is that when a scare card hits and you have the betting lead, it's up to you to decide how scary that card will become. Here, we would like to keep things very comfortable for our opponent. We should immediately start to bet in a manner which represents that we have something like KQ, a hand that would be stuck here between a rock and a hard place. It would be hesitant to bet huge, just in case Villain has an ace. It would also be hesitant to check, lest Villain check back with one of the two flush draws and get to take an absolutely free card. So, if we had KQ, we'd probably bet around $60. For that reason, that's exactly what we should do with AK. We do so for one very specific purpose: getting maximum value from Villain's decent queens. Villain may call off on the turn for $85 with something like KQ, but will very likely fold even a blank river to another half-pot bet. In contrast, Villain may not only call $60 on the turn with KQ, but also stands a good chance of calling another roughly one-third pot-sized bet on a blank river (around $95). That means we stand a decent chance of making an additional $70 on the river by sacrificing $25 of more certain value on the turn. After review, that seems like a good gamble. A smaller sizing of around $60 would have been preferable on this turn. As played, the river pot is $330. The river card is the , for a final board of . Hero bets $150. Villain tanks for a bit while muttering things like "pocket kings" and "hit an ace." He finally decides to fold, but looks like it was a very close decision. Villain's verbal ruminations give us a pretty clear indication that he is struggling over whether or not to call with a decent queen on this blank river. If he was this close to a call for $150, we can know with near certainty that he would have called off if we had used the $60 turn sizing followed by a $95 river bet. More careful adjustment of our bet sizing on all streets could probably have gained us an additional $70. When it comes to bet sizing, sometimes less is more. Making smaller bets in appropriate spots can earn you more overall by getting your bets called over three streets, instead of just two. His and Hers Poker is a free, weekly strategy podcast hosted by Matt and Tracey Waldt. They are a married couple who play live cash games on the East Coast. Their podcast focuses on providing practical advice about hand reading, with an emphasis on how to identify and exploit the common leaks and imbalances of low-stakes players. His and Hers Poker can be found on iTunes, Google Play and other podcast services. For more information, and to subscribe, please visit hisandherspoker.com.